Diversifying your product portfolio can lead to expanding your share of wallet with your customer base, as well as make your offerings appeal to a broader market base. The key is tying product development resources (engineering, product management, etc.) to real customer requirements and maintaining the customers’ perspectives of wants, needs and usages throughout the development process. Alpha and beta testing with customers is essential before finalizing go-to-market plans. Related to a market expansion strategy as well as product diversification, a market opportunity analysis can be used to flesh out potential ideas. The very notion suggests that a company is more interested in a market perspective than its own often-assumptive perspective. The scope of such analysis can range from straight forward and short-term, to expansive and longer term. An initial sense of what’s at stake may call for patience in conducting the more comprehensive study. Or, competitive pressures may drive a company to quickly complete its assessment. The outcome should include: target markets (by type and geography), current solutions assessments (how problems are being solved today), an extrapolation of solutions scenarios (often driven by forecasting the impact of technology and other economic drivers). In a crowded market (some refer to this as a red ocean), competitive intelligence is critical to both operational and strategic decision making. A rigorous and regular approach to competitive position, direction, and strengths and weaknesses can help senior executives identify gaps and opportunities. The implications and usages for such learnings can be highly strategic (what new markets or segments should be pursued) to very tactical (what messaging will better position our offerings in our on-going promotional activity. 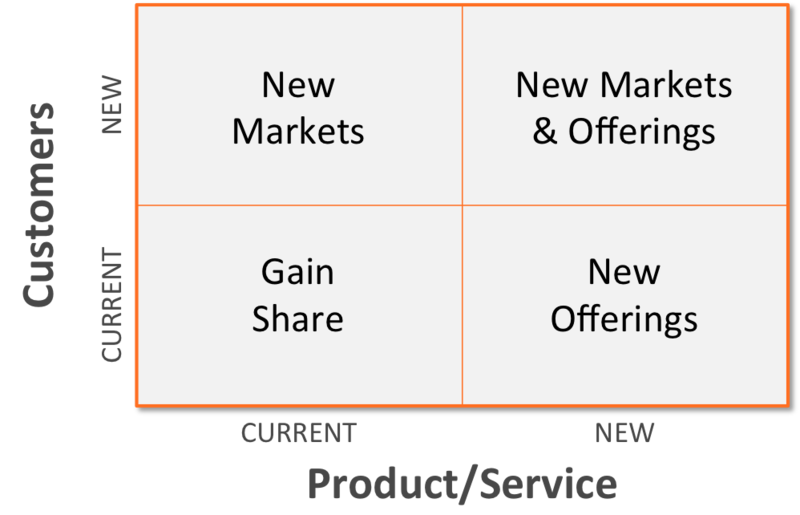 Segmenting markets, targets and opportunities can yield greater clarity and more specific relevance for a company and its offerings. In some cases the same product can be repositioned to be made more relevant to a segment. In other cases, a solid market segmentation strategy will help justify new market entries and product development. This activity always leads to greater insights and clarity for how a company can serve its current and potential markets. Chief Outsiders provides part-time strategic marketing consultants with insights on business growth strategies, market positioning strategy and marketing strategy implementation.